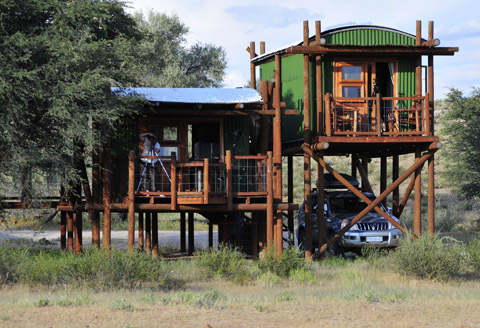 Urikaruus Camp is an unfenced wilderness camp situated in the dry Auob riverbed in the Kgalagadi Transfrontier Park. Each of the four riverside cabins are built on stilts and are connected by elevated wooden walkways for comfort and safety. There is petrol and food items at Mata Mata camp (about 550km North) or at Twee Rivieren camp (about 70km to the South). You should take your own water, food and charcoal / firewood when you stay here. 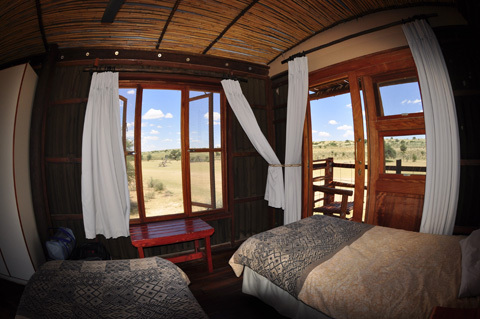 Each cabin has a view of the waterhole that is situated just fifty meters from the cabins. The waterhole is not floodlit so please bring your spotlight with! We have had great sightings of lions, cheetah, African wild cat, spotted hyena, brown hyena, caracal and leopard here, by day and night. Have A Great Story About Your stay at Urikaruus? Do you have a great story to tell and photographs to show about your stay at Urikaruus Wilderness Camp? Please Share them!